Government will sympathise with home-seekers who were fleeced and illegally settled by land barons as it moves in such areas to bring order and sanity as well as create self-containing urban settlements, a Cabinet Minister has said. 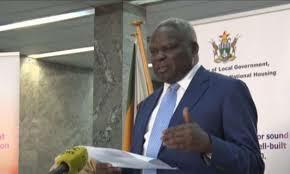 Local Government, Public Works and National Housing Minister July Moyo said when Government and local authorities embark on the Urban Renewal Project, they will also move into settlements which do not have requisite infrastructure and redevelop them. “There is a lot of developments that have taken place. Government and the city were giving land to the cooperatives. Some of those cooperatives have turned into land barons. Whether they were given land by the city or Government, the effect is the same,” he said. He said Government will show no sympathy to individuals who settled themselves as they will be removed once Government and council moves in. Minister Moyo said Government and the city are in serious trouble because they have to chase after people who are resettling themselves. He said at some point, both the city and his ministry will have to go to those areas and redevelop them citing examples of Caledonia, Harare South and other areas where there is no sewerage, no water or city centre. “We want to create urban settlements which are self-containing. If you just go around here in Harare, look at Mabelreign which was the lowest of townships for whites but you can see a centre with post office, banks and police. That is what we want to create for our own people. Where we have not done it, we will go and do urban renewal although it is a new place,” he said.